One of the apps on my phone tells me I'm in the home stretch and it definitely feels like it! Here is what's going on lately. -Weight gain: 29 lbs! Yikes, and I still have like 5 weeks to go! -Although I can still fit a few of my pre-maternity jeans with the aid of the belly band, I live in leggings. My usual outfit composes of a basic tee, cardigan, leggings, boots/flats and some accessories like a scarf and/or necklace and a belt hiked way up above my belly. -Hudson's room is 95% finished. Nathan hung all the pictures last week, and then last night he put up the 32" flat screen. His room is too small to fit a rocker or glider in it, so we bought a rocker/recliner that fits in our living room so we will rock him out there. It will be multi-purposed. -My acid reflux has gotten really bad and Tums just aren't cutting it, so my doctor advised that I take Pepcid and if that doesn't work she sill prescribe me a medication. -My sleep has become even more fragmented. I am now getting up about 4-5 times a night to pee, combined with the acid reflux, sore ligaments and other random upsets I am not sleeping much. 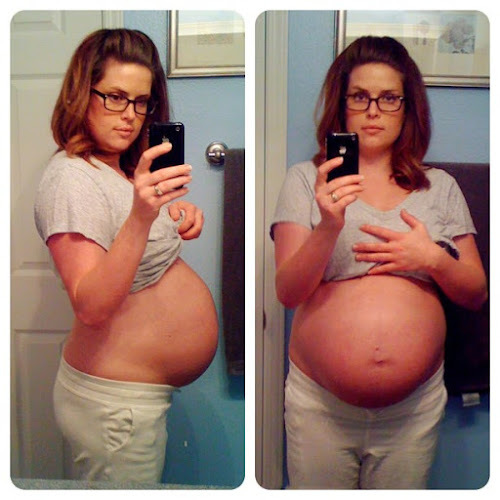 -Before I was pregnant I would snore every once in a while and only if I has congested, in a deep sleep and on my back. Now I snore like a truck driver every night no matter how I am lying. Poor Nathan. The other morning I found him sleeping on the couch because he didn't want to disturb me. I felt so bad. -Hudson is super strong and I can feel him pushing on my innards all hours of the day. He is already a very active little boy. -We took the tour of the hospital we will deliver at which was very informative. It made me feel more at peace about the whole process. -I still gag when I brush my teeth. -No swelling! I can still wear all my shoes and wedding ring. 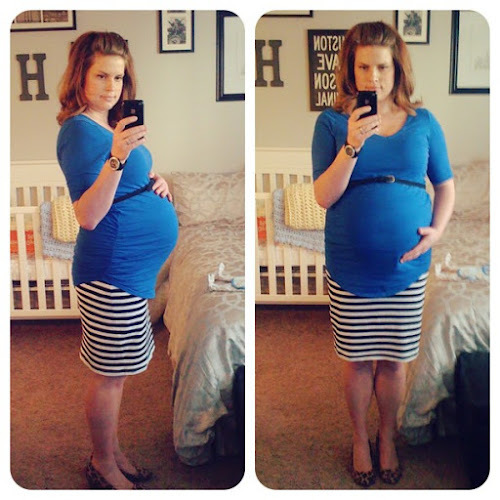 I've enjoyed being pregnant, but I am getting anxious to have my body back and to hold my little guy. Doing the tour made it much more real and it is crazy to think he could arrive in less than a month. You should go see my chiropractor dr. grade. i went to him with Lc bc I too had bad sciatica. Its safe and totally worth it girl. i'll be going next week bc my back is starting to hurt. You look great and be sure to start stretching at least a little everyday too. it will really help with labor. Looking good! I never did the hospital tours! Yeah for the home stretch! You are so good about blogging! You inspire me to be better at it. One day you will love that you recorded so much about your pregnancy. I wish I had kept a better journal with each of mine. You are getting close! The last few weeks go so slow, but at the same time they fly...doesn't make much sense does it??? My friend who was due the same wee as you had her baby the day after Christmas!! Hopefully Hudson doesn't give you any surprises like that!